I’m excited to share this episode with mindfulness educator, corporate trainer, podcast host and author of “Mindful Parenting in a Messy World,” Michelle Gale. 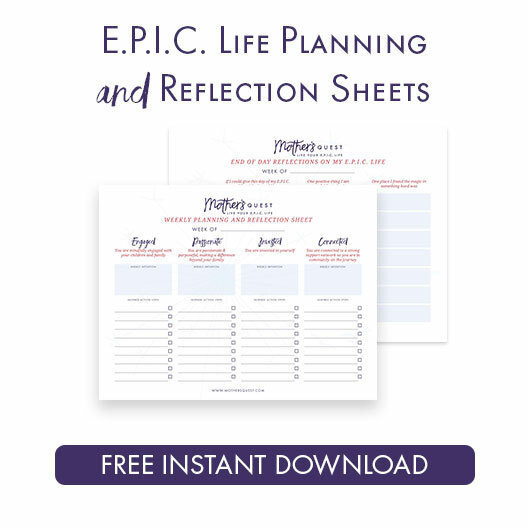 This conversation, rooted in how to bring more equanimity to our lives–finding our center of calm in the storm–came to me just when I needed it most, during a start to my fall season marked by big school transitions for my children, travel away from home, and supporting my family after my father’s bypass heart surgery. In the midst of all of that, it was such a gift to have this time with Michelle, whose journey brought her from working in technology startups like Twitter to a deep dive in mindfulness training. Michelle draws on that training today as an advisor to organizations like Wisdom 2.0, in trainings with corporations like Disney and Google, for summits and workshops for parents that she organizes, and as a parent with her own two boys at home. An awareness of our impact in the day to day, through being a mindful parent, is something that Michelle embodies in her own parenting, in the appreciation she describes for her own mother, a single parent who adopted Michelle at the age of four months old, and in the ways that she makes mindfulness relatable and accessible to those she teaches. I learned so much from Michelle in the time we spent together, about answering our own calls for life-long learning, about slowing down, raising our awareness and making the implicit explicit, of the importance of bringing compassion, especially during times of transition, and how to draw on our experience as mothers as a source of learning and transformation. When we began, I asked Michelle to lead us through a Three Breath Practice which I heard her share about on Deborah Reber’s TILT Parenting Podcast. The practice became the bookends for this episode, the opening that allowed us each to make intentions for our time together, and the challenge that Michelle invites us to integrate into our lives. As you listen to this episode, I invite you to slow down by taking your own three breaths with us, tap into Michelle’s intention for finding “equanimity,” your center in the midst of chaos, and open yourself to Michelle’s wisdom. If you do, I’m certain you’ll find more of your calm in the storm and connect more fully to your own mindful parenting in a messy world. The Three Breath Practice and how I’ve begun using it to help me make better decisions about how to use my time. The concept of “equanimity” and the importance of creating awareness and space for our discomfort so that we can come back to our center. Michelle’s appreciation for “Attachment Theory” through the lens of her own experience being adopted at the age of four months. Also the realization that she doesn’t have a newborn photo and how that drove her inquiry about who was mothering her before she was adopted. 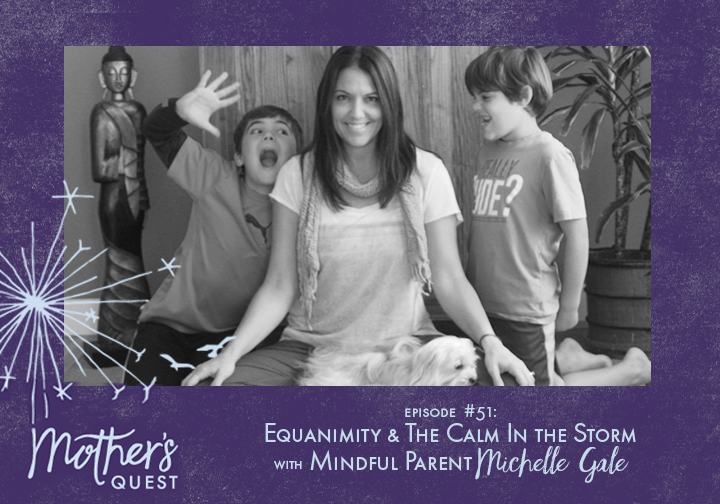 Michelle’s journey to mindfulness and how she roots her practice in the day to day experience of mothering, especially in the challenging moments, like when our children can’t fall asleep alone or when they struggle with homework. Michelle’s ritual before sitting down to do creative work that she has introduced to her children as well before they do homework. Michelle’s passion for changing the landscape of how corporations think about supporting parents and the E.P.I.C. snapshot moment that happened for Michelle during a training at Macy’s. 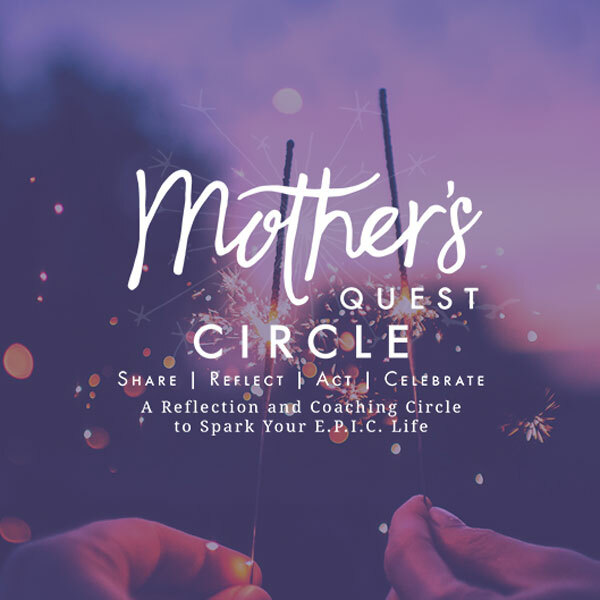 How her experience in circle and community enabled Michelle to call more of that connection into her life and more about the tools she uses to “call in”. How Michelle is bringing her mindfulness practices to her health, especially as she navigates the transition to menopause and the hormonal swings and changes that come with it. Katie Krimitsos, CEO & Founder at Biz Women Rock and the Women’s Meditation Network and the host of the Meditation for Women Podcast. Katie’s beautiful dedication shines a light, through the example of her mother Linda, of the ways we can make an impact in our day to day lives through being a mindful, loving parent. You can connect with Katie on Facebook, Instagram or through her website. Asking yourself, what’s really important and what really matters? By noticing an area of our lives that needs more consciousness (like reaching for our phone for distraction for instance) and using this practice, we can invite more intentionality, awareness, connection, and equanimity into our lives. Michelle Gale is the podcast host and author of the book “Mindful Parenting in a Messy World”, a mindfulness teacher, executive coach and a corporate trainer. She works in corporations, schools and communities teaching and speaking to fellow parents about mindful parenting. 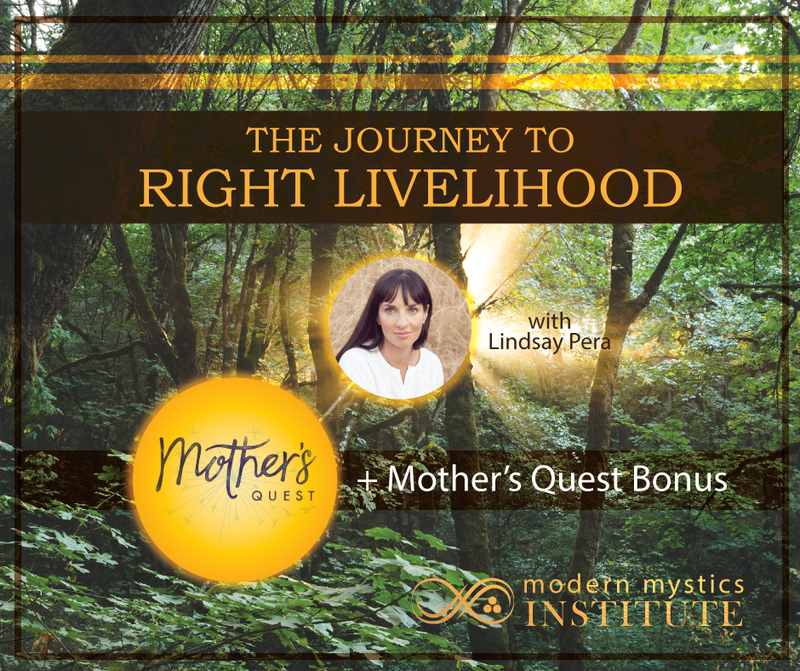 I’m so excited to be part of a special program, Journey to Right Livelihood as a learner. 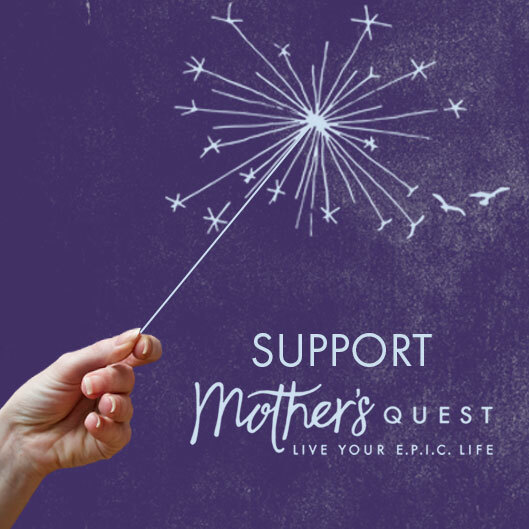 And as an affiliate, I’ll also offer Mother’s Quest bonuses to deepen the experience for members of my community who decide to come along too. 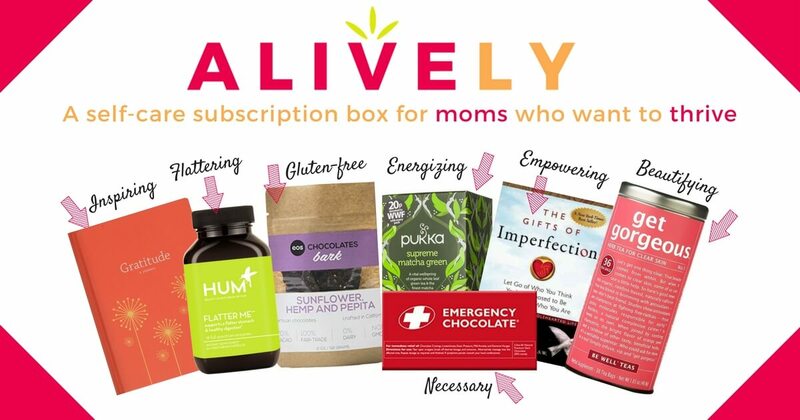 If you’re interested, you can learn more at this link and also come over to my private facebook group, where I had a conversation with the founder, and one of my teachers and mentors, Lindsay Pera. It’s not too late to join us! 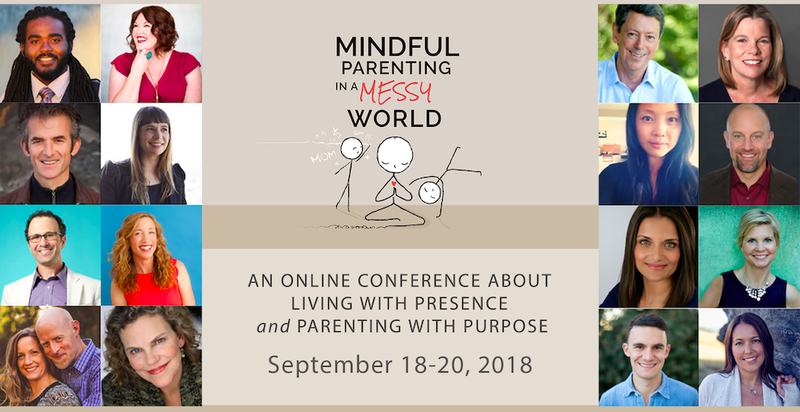 Expert advice to find more peace, ease, presence and spaciousness in your family through the Online Conference hosted by Michelle and a phenomenal group of mindfulness experts. Learn more and purchase the conversations if you choose by visiting the site here.